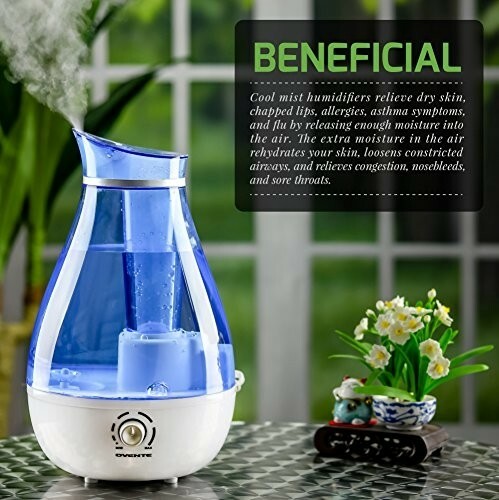 BENEFICIAL – Cool mist humidifiers relieve dry skin, chapped lips, allergies, asthma symptoms, and flu by releasing enough moisture into the air. The extra moisture in the air rehydrates your skin, loosens constricted airways, and relieves congestion, nosebleeds, and sore throats. 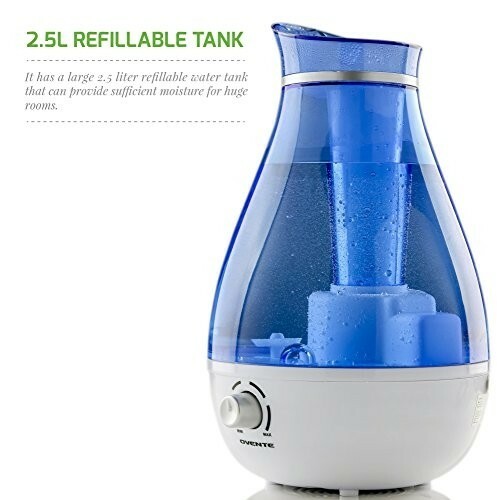 2.5L REFILLABLE TANK – This humidifier has a large 2.5 liter refillable water tank that can provide sufficient moisture for huge rooms. To refill the tank, turn the knob to “min” or “off”, unplug from the outlet, detach the parts, and then add water to the tank. ADJUSTABLE MOISTURE – With its moisture control knob, you can set and adjust the humidifier’s moisture output. To set the desired moisture level, turn the control knob from “min” to the desired moisture level. After one or two minutes, the mist will come out from the mist outlet. 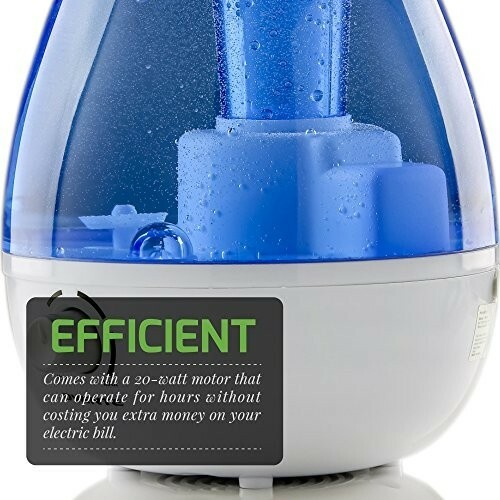 EFFICIENT – The humidifier comes with a 20-watt motor that can operate for hours without costing you extra money on your electric bill. In addition, it has an easy-to-see indicator light that indicates that the humidifier is working. EASY TO CLEAN – Cleaning the humidifier is as easy as pie – Make sure that the humidifier is turned off and unplugged from the power outlet, remove the tank from the base and pour the remaining water out of the tank, apply cleaning solution into the tank and brush with soft brush, rinse with water, and then wipe the humidifier base and tank with soft, dry cloth. 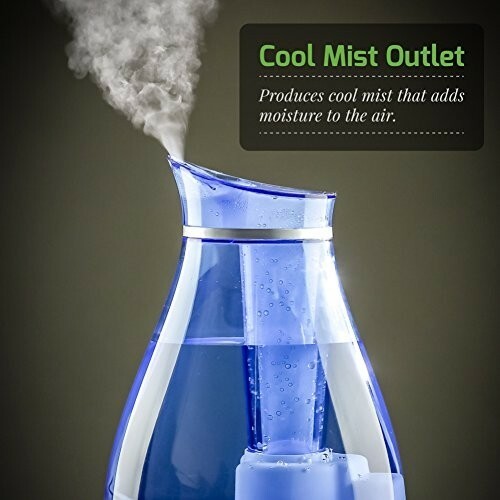 A cool mist humidifier is an important tool in every household because there are so many ways in which it could be used. The evident and most common application of the humidifier is to set the proper humidity of the room. Achieving a balance humidity level is known to benefit the skin as well as the general health of a person. The level of the humidity in the air also determines the ease of spreading viruses and infections; ideal levels of moisture would lessen the probability of airborne diseases. 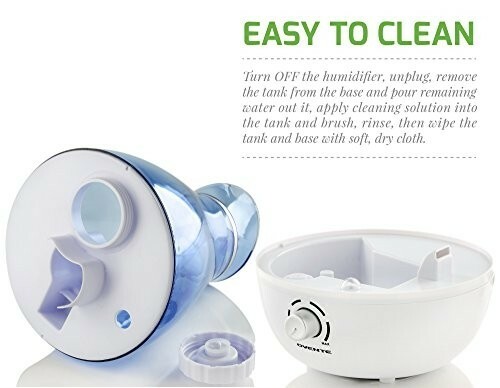 Get your own Ultrasonic Cool Mist Humidifier from Ovente and keep the air clean at your home! Having a cool mist humidifier can give many benefits to you and your family, such as relieving dry skin, chapped lips, allergies, asthma symptoms, and flu by releasing enough moisture into the air. 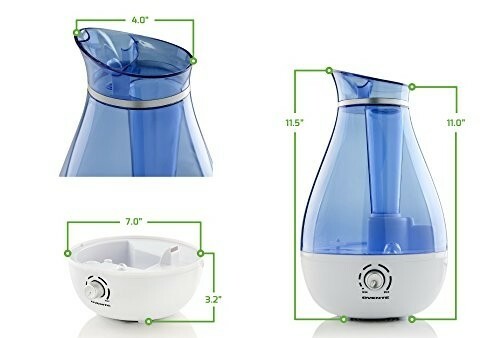 This humidifier is suitable to use in bigger rooms, as it has a 2.5 liter refillable water tank that can provide enough moisture for huge rooms. With its adjustable moisture control knob, you can freely set and adjust the humidifier’s moisture output. 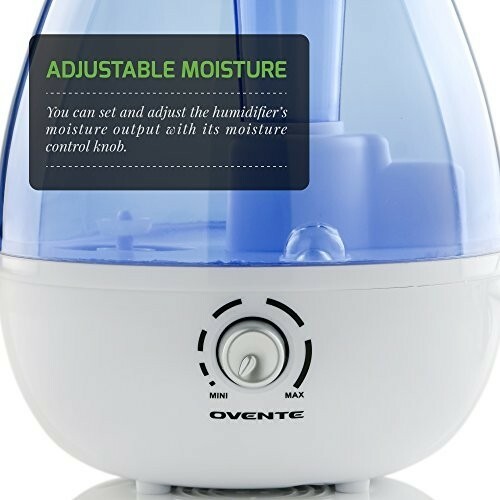 The Ovente Cool Mist Humidifier comes with an easy-to-see led light that indicates that the item is working, and a 20-watt motor that can work for hours without costing you extra money on your electric bill! 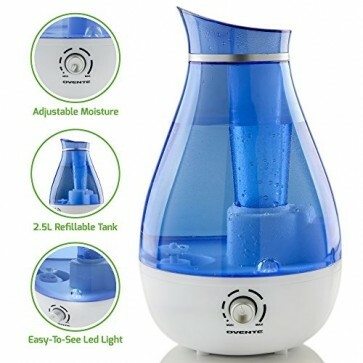 To clean the cool mist humidifier, always turn it off and unplug from the power outlet before removing the water tank from the base, pour remaining water out of the tank and apply cleaning solution, clean the inside of the tank with a soft brush, rinse with clear water, and then dry with a soft, dry cloth. To maintain the humidifier, always keep it clean and dry when not in use.